Coverage: Cottage in the Dales offers 5 star luxury holiday cottages in the Yorkshire Dales National Park. Specification: The customer required a content-managed, mobile-friendly website to replace their existing one which was done some years ago. The site is dynamically generated through the use of a MySQL database and all aspects can be managed by the owners including adding pages, managing the content and availability/pricing. "Having been awarded the best self-catering in Yorkshire in November 2016 and the best self-catering property in England in April 2017, we could not have done this without Carol at Sleepy Frog Designs - it is that simple! The website is one of the key supporting elements in terms of winning these regional and national awards. In early 2016 we needed a new website to replace the 8 year old website that had so many limitations - in terms of design, templates and only a few text areas that could be updated. The website also couldn't incorporate our chosen online reservations facility or have the ability to take credit card payments. 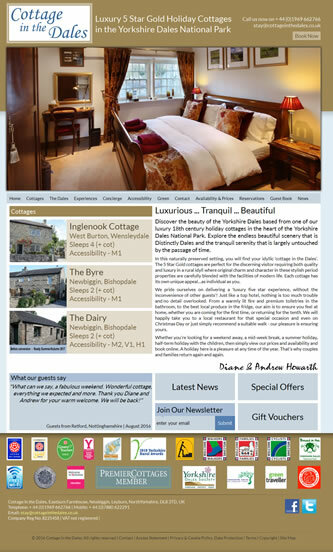 We gave Carol design ideas and requirements for the website to match the quality of our cottages. She delivered a design and content management system that allowed us to be able to add the words and photos without any technical knowledge ourselves. The Supercontrol booking system was incorporated seamlessly along with excellent SEO optimisation which we are then able to manage going forward. Meeting the design requirements, the result is a very professional website that is very user friendly and enables us to showcase our luxury holiday cottages at their best. Most importantly it provides us with the flexibility to add cottages, add content and photos and grow the business to meet the needs of today's guests who are increasingly more demanding in what they are looking for.